Martin Johnson is regarded as one of the greatest locks ever to have played, and one of England's greatest ever players. He toured three times with the British and Irish Lions, becoming the only man to have captained them on two separate tours. Martin also led his club Leicester Tigers to consecutive Heineken Cup victories, won the league five times including four consecutive victories as captain and won the Pilkington Cup twice. 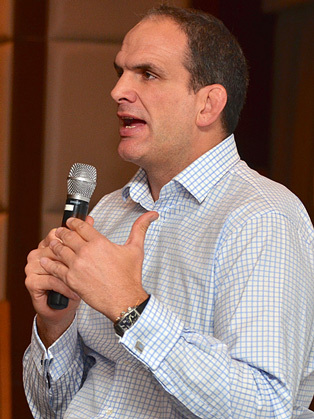 He became the new England team manager on 1 July 2008, replacing the previous manager Brian Ashton, but left the post in November 2011 following England's quarter final defeat at the 2011 Rugby World Cup. Martin is also an expert on the history of Rugby Union, having written a book on the subject. Entitled Rugby and All That. Martin offers audiences considerable insight into the game of rugby and the forces behind his own success both on and off the pitch, delivered with charm and a well placed sense of humour.